Oh, my. This is crazy. Twitter user @Msixelaa -- real name Bree -- is going to tell you a quite personal story. 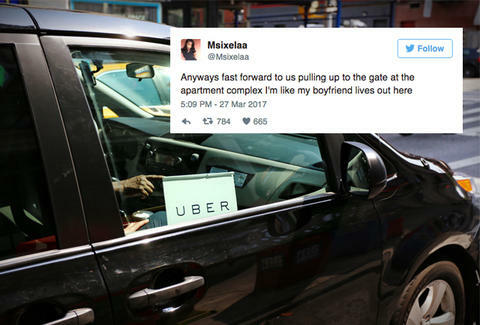 It's riveting social media storytelling and earned her the title #UberBae on Twitter where unrolled this fable. Bree recently became an Uber driver. She drove to the airport to pick up a fare and slowly realized as she drove to their destination that something wasn't right. She says the fare was her boyfriend's other girlfriend, coming into town for a visit. Yup. This story is so good she can go full Sunset Boulevard and start with the end. Then things start to get serious. That's a truly horrible situation to be in. #UberBae told Complex she eventually returned the luggage and didn't wind up in any trouble with the police. "It’s just a complaint file, basically," she said. "If something else happens, the police officer let me know that it would be civil. She would have to press charges and go to court. But she can’t press charges against me! She charged at me first. That apartment complex has, like, heavy cameras to see that." While her story hasn't been verified, her candid interview might sway some. Asked why she told the story on Twitter, she said, "It's the only place to vent where people can make a joke out of a serious situation to kinda make you at ease. I just didn't expect so many people to go crazy." She told Complex she wouldn't post something personal like this on Twitter again.